WarLight has just been updated to version 3.07.0! This update adds the ability to play coin tournaments, as well as overhauls a lot of the existing tournament system. It’s now possible to create and join tournaments that give coin rewards. Coins, for those who are new to WarLight, are redeemable for cash, so this means that you can make real money from WarLight tournaments! Each coin is worth $0.01 USD, and most tournaments will cost only 6 coins to join (6 cents). This gives opportunities for huge winnings! Winning coins from tournaments also counts towards the coin leaderboard, which can help vault you to even more winnings! Coin tournaments can be created by players, so this also marks the first time we’re allowing players to choose their own settings for coin play. The only restriction is that you must use pure-skill settings since there cannot be randomness in coin games for legal reasons. Coin tournaments can be single-elimination or double-elimination. Single-elimination tournaments will give 70% of their reward to first place and 30% to second place. Double-elimination tournaments give 65% of their reward to first place, 28% of their reward to second place, and 7% of their reward to third place. Entry fee and prize: In this mode, everyone who joins the tournament is charged an entry fee (usually 6 coins). These tournaments have the largest jackpots. Pure-skill settings must be used. Free with prize: In this mode, anyone can join the tournament for free. Coin prizes are still given out, but they will be smaller than the above type. Pure-skill settings must be used. Free without prize: In this mode, anyone can join the tournament for free, and no prizes are given out. We want all open tournaments to have a coin reward to make them exciting, so we hope this option is not used often. This mode only exists for people who really want to use non-pure-skill settings for some reason, and legally we cannot give a coin reward when non-pure-skill settings are used. Tournament creators also have an option to create tournaments with even bigger than normal jackpots. They can do this by upping the “coin multiplier setting”. For example, setting the multiplier to 2 causes all coin numbers for that tournament to double. For example, the entry fee goes from 6 to 12 and the jackpots are all doubled as well. This is the only case where tournaments will cost more than 6 coins to enter. In a team coin tournament, the winnings will be split evenly between all members of that team. Our goal is for most open tournaments have a coin reward, as tournaments should be exciting events that really get your adrenaline pumping. To facilitate this, the tournament creator puts up part of the reward when creating the tournament. It’s easy to experiment and see what the tournament creation options are, simply visit the Create Tournament page, select Public Tournament and you can drag the sliders around and see how it affects the rewards. In team tournaments, you can hover over a team’s name to see a list of all the players in that team. In Round Robin tournaments, the line that connects two players will be shaded green on the winner’s side and red on the loser’s. This makes it easy to see if someone has been winning or losing a lot by how much green/red is near them. The Players tab shows how many wins and losses each player has, even for in-progress tournaments. When inviting players to a tournament, you can search for people by name, even if they’re not on your friends list. It also allows you to invite based on clan. Prior to this update, it was very difficult to get a real-time tournament off the ground. This is a shame, since there are a lots of players who love playing real-time games. With this update, real-time tournaments are now scheduled for a specific day and time when they are created. They will automatically start at that time if enough players have joined. If not enough players have joined, the tournament will wait 30 minutes to see if enough players join. If 30 minutes pass and the tournament still is not full, it will be cancelled. If a coin tournament is cancelled, any entry fees paid by people who joined it will be refunded. – “Fast” for multi-day games now means 25 hours instead of 24. This allows people who play around the same time every day to participate in these games. The borders you see in this screenshot are resizable, or can be clicked to be collapsed completely. This is a way to give more space for the tournament bracket when you need it, and it’s far more flexible than the current “hide players list” button. The Players tab shows how many wins and losses each player has, even for in-progress tournaments. 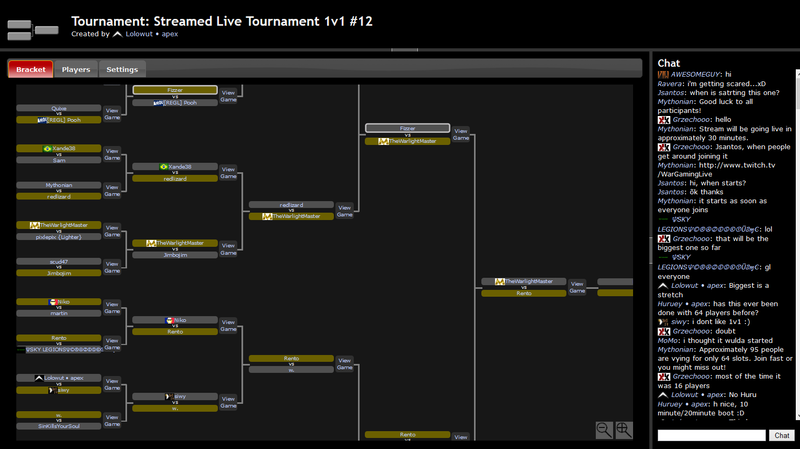 This makes it easier to see how a tournament is going while it’s in progress, especially round-robins. Thanks to everyone who submitted logos to the Logo Design Contest! But it’s come time for us to pick just one to be the winner. Are you an experienced graphic / UI / UX designer that plays WarLight? We’re looking for a professional designer for some paid contract work. If you might be interested, please e-mail your portfolio and resume to fizzer@warlight.net. Thanks!